Humanly speaking, it is impossible. But not with God. It is only a few days before end of 2017! I am writing to share with you a few of the wonderful ways YOU have helped to change the world this year with MCC. In every nation, MCC is doing AMAZING ministry that is Transforming the World! Feeding the hungry, clothing the poor, visiting the sick and those in prison, assisting those suffering from flooding and hurricanes is just the beginning how each church, ministry, clergy and lay person share of themselves.The people of MCC showed up and supported those impacted by flooding and hurricanes. Resurrection MCC in Houston, Texas, USA, is recovering from feet of water in the church. All of the MCC churches in Florida, USA, were spared damage to the worship spaces, left with clean up on the grounds! The suffering in Puerto Rico continues. Over $10,000 has been raised for the people of Puerto Rico, USA, because of your generosity!Over the last 10 months, I walked through pantries of food stocked by local and area government partnerships feeding hundreds in each community weekly.At New Light MCC in Hagerstown, Maryland, USA, the food and hygiene items are housed in an outside storage area to allow people to donate or take as needed, no barriers, no hours, just meeting the need.Ministries to visit LGBTQ prisoners continues to grow!Without MCC churches, clergy, and laity supported each day by MCC global leaders, this and much more would not be possible. Refugees and immigrants fleeing persecution, imprisonment, and war are alive today because of MCC! A lesbian couple fled Syria and recently arrived at MCC Toronto through the Rainbow Railroad. A few years ago, a young Muslim gay activist and small group facilitator from Burma, with the help of friends, started the first LGBTQ-affirming publication. As of earlier this year, most of the people who started the publication were murdered. Through international and MCC connections, this young activist found safety in Germany. His story not only inspires, but his leadership continues. 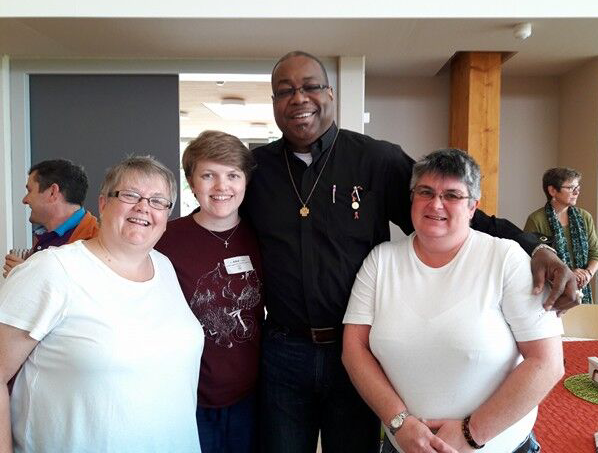 He led the “Lord’s Prayer” for the MCC Europe Network Gathering where six languages were raised in prayer together; it was a Pentecost experience. 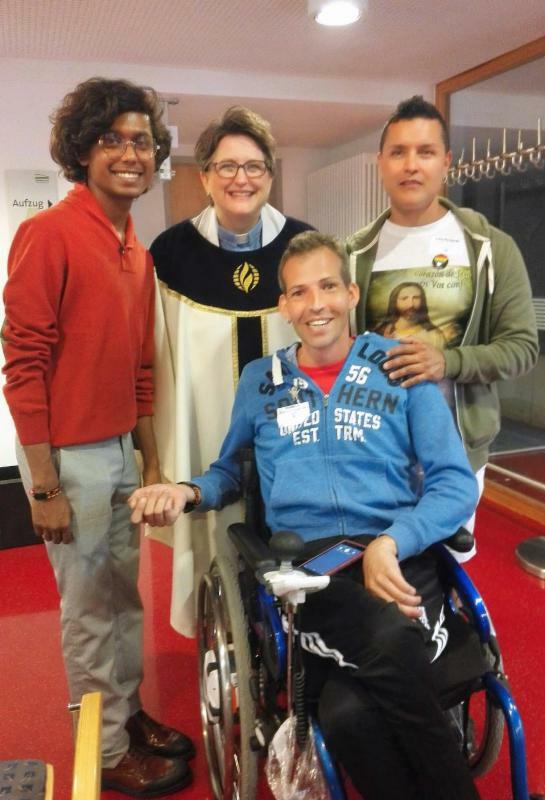 Photos from the European Network Gathering, hosted by MCC Stuttgart. Above: New Governing Board member, Dr. David Williams (center), joins others attending the event. Indeed, everything is possible with God. MCC is a voice in the wilderness for these and hundreds more this year! New ministries are beginning in East Africa, Brazil, Cuba, and in the United States. Emerging Churches are opening that offer worship in both English and Spanish. Young adults, transgender, queer, elderly, heterosexual, new believers, spiritual seekers are meeting in over 40 MCC Emerging Churches around the world.MCC now has an Affiliated Church in Hattiesburg, Mississippi, USA. With over 75 in worship in only two years and hundreds watching weekly through Facebook, this is a growing tribe of radical Christians! Welcome Joshua Generation MCC! Affiliation certificate. 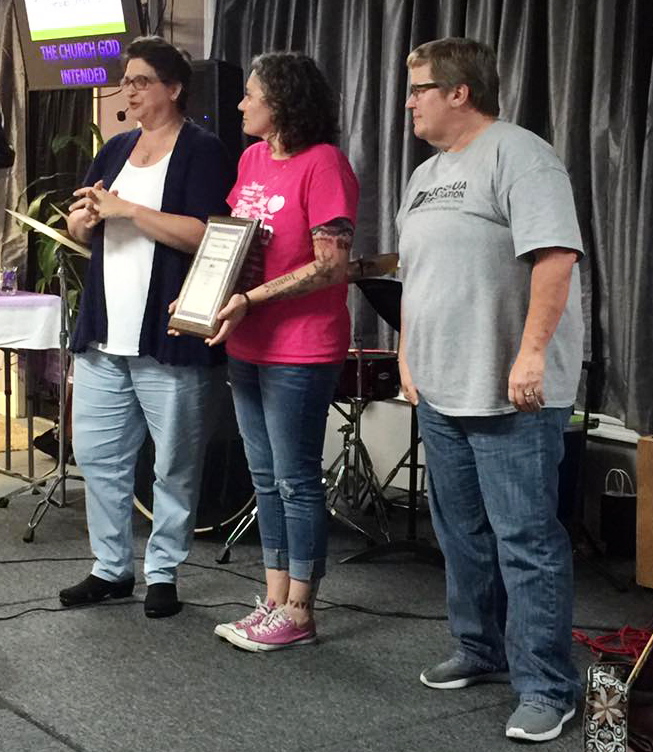 Pastor Brandiilyne Magnum-Dear (center) and Susan Magnum accept the certificate. In 2017, because of your generosity, MCC continued vital conversations, and started new ones, about gender, race, and global inclusion. The International Women’s March raised awareness of women’s issues in this modern era. MCC was there in many cities and nations. The work of inclusion in MCC continues to expand as the largest number of women ever are entering ministry in Brazil to the success of the Women’s Conference in Florida, USA. While the struggle for transgender rights and justice continues, MCC is meeting spiritual needs by offering Rites of Renaming, creating spaces for transition, acknowledging preferred pronouns, training, empowering and ordaining Trans and Non-Binary persons. Persons of African Decent Gathering and Worship at the Brazilian National Retreat, the USA Persons of African Decent Conference in St. Louis, and the “Are We Free Yet?” conversation on white supremacy by Persons of Color all celebrated, educated, and created sacred space for blackness in MCC. We are starting new conversations about whiteness and white supremacy. Persons of African Descent Gathering and Worship, hosted at the Brazilian National Retreat. 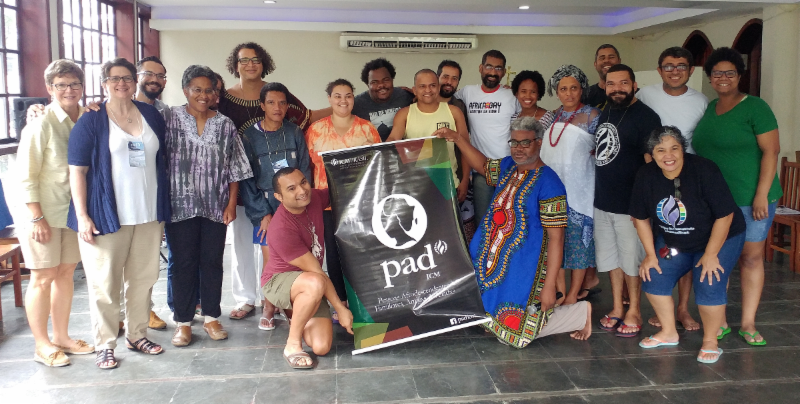 The MCC PAD Conference created opportunities for dialogue and training, in addition to worship in the evenings. In 2017, all Networks began the final shift to local leadership. 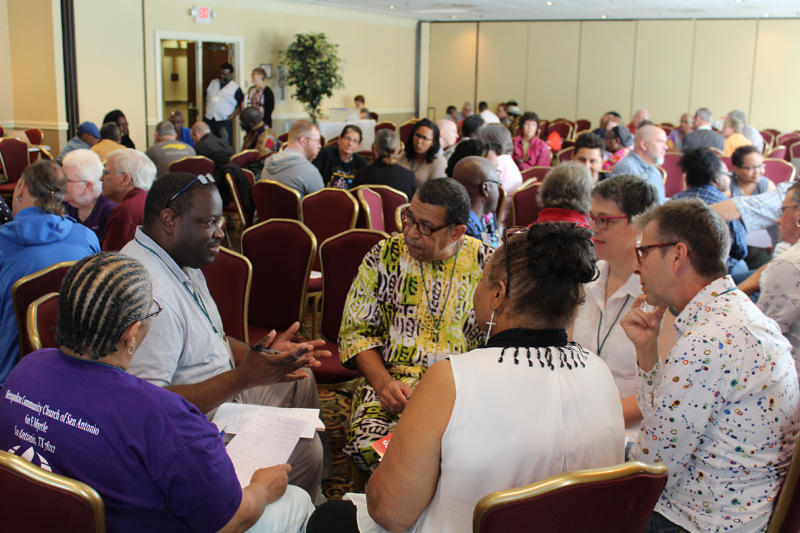 The Governing Board is currently working with local leaders to file for national recognition of MCC churches, ministries and clergy in four nations. We hear you! MCC is needed now more than ever! And there is plenty of work yet to do. I am up to the challenge to lead MCC forward with YOU! Each Church, Ministry, and Leader is committed to being Inclusive Communities that Spiritually Transform and do Social Justice in the world! Together MCC can expand in every way to ensure more people are involved in the discerning, planning, and building of a 21st Century MCC. MCC Leadership Bodies are Transforming Ourselves to better serve the people of MCC! The Strategic Leadership Team and Governing Board led the effort to focus MCC’s financial and staff resources on Programs and Projects that build, educate, and support diverse New and Existing Churches, Ministries and Leaders. What does this mean? Funding moved away from cost-centers, such as offices, to investing in MCC programs and projects that support the MCC Core Values of Inclusion, Community, Spiritual Transformation and Social Action. What does this change look like? A focus on resources for Local Churches, Ministries, and Leaders. Expanding ways people can serve in ministry through the development of Flexible Pathways to Ministry in MCC which will be completed in 2018. Providing direct support of the Council of Elders for Local Churches. An MCC confidential database through SalesForce Non-Profit program to better connect with you! The Assessments Commission has spent the year evaluating and surveying local Churches to explore the current assessment system and provide recommendations to improve the ways in which churches support the wider mission of MCC. We need YOU to end 2017 strong! I can promise you right now, there will not be a deluge of messages coming over the next few days counting down to the end of the year. You already understand the need for MCC is great and the impact is counted in lives transformed. Yes, we need your generosity as the year comes to an end. Today, if you give an above and beyond End of Year Gift* (https://bit.ly/2xbyHro) of $100, $500, $1,000 or more in your own currency, MCC will end this year with a balanced budget. If a hundred dollars or more is too much, please consider giving $49 in honor of MCC’s 49th Anniversary! Share the message of MCC and invite two of your friends to give an End of Year Gift* (https://bit.ly/2xbyHro) to support Inclusive Communities that Spiritually Transform and do Social Justice in the world! Yes, that is what we do every day in MCC! Give online* (https://bit.ly/2xbyHro) and select GENERAL FUND in the menu; or send a check before December 31, 2017, to PO Box 50488, Sarasota, FL 34232. Your gift means Hope, Peace, Joy, and Love to many hearts around the world! Thank you for all that you already given of your time, your many gifts and skills, and especially your financial gifts. *Select 2017 Year End Gift (General Fund) from the Donation options. MCC is a 501(c)(3) nonprofit religious organization registered with the IRS. Gifts from USA residents are tax deductible.